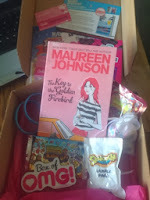 We love this bi-monthly Box of OMG! It is full of fabulous girlie goodies. The Box of OMG! are delivered on a bi-monthly schedule, and are totally free, however you may not be one of the lucky ones to be allocated a free box and you may miss out. You can however pay a £4.99 subscription every two months (free to cancel any time) to guarantee yourself a MEGA box, which includes even more goodies than the free box. Also OMG have been listening to all their fans, many of whom were not happy with the delivery set-up for the free boxes, previously they delivered to your nearest By-box, but some of the nearest By-box locations were not that near! Now OMG will be delivering direct to your door! They do say they have streamlined the box to fit right through your letterbox - Unfortunately our box didn't fit through our letterbox, and as we were away for the week it went back to the Post Office, which I picked up on Saturday! But much better than having to travel to the nearest By-box to pick it up. All your need to do to get your hands on one of these exclusive free Boxes of OMG is sign up at the website HERE - You can also earn and collect codes which earn Awesome Points and the more points you have the better your chance of being allocated a free box. Then all you do is keep an eye on your emails to see if you’ve been chosen - but be quick as you only have 48 hours to claim the free box! Two rubber band bracelets 'Ruby Redfort' both in blue colour. A 'Box of OMG!' sticker. Mooshi monsters Mash-up trading cards. A sample pack of Skwooshi - really pleased this was included, as I have been considering getting it for Jacob for Christmas but wasn't sure what it would be like - now we get to try it. 'The Key to the Golden Firebird' by Maureen Johnson. Then finally a few promotional cards introducing you to Apps, and books.